It is hard to imagine a world without bridges. Bridges lie at the heart of our civilization bringing growth and prosperity to our society. It is by virtue of bridges that communities are able to physically connect to new people and to new places that were previously disconnected. However, bridges are more than mere functional assets. A well-designed bridge reflects mankind’s creativity and ingenuity. The way that our bridges are commissioned, designed and procured is rapidly changing. Nowadays, a large number of experts from many different disciplines work on the design during different phases of the project. The segregation of knowledge into discipline-specific fields, and the fragmented approach to bridge procurement, have resulted in a general lack of cohesion in bridge design. 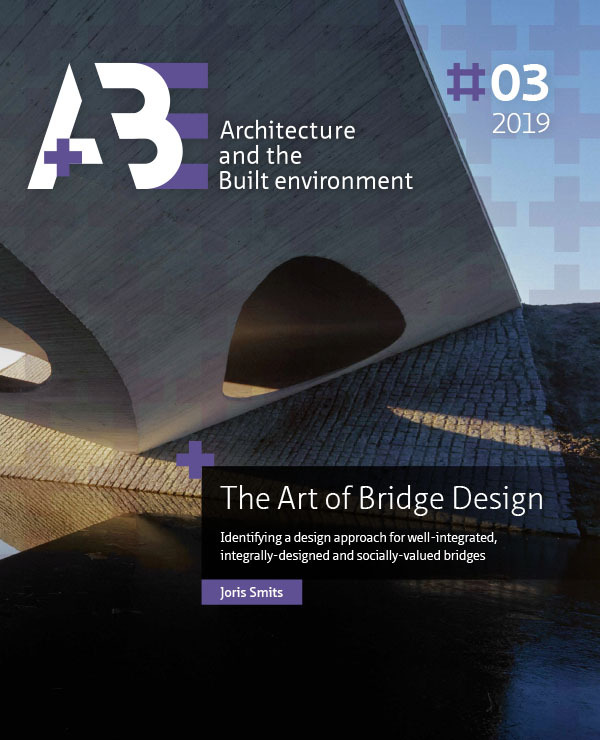 The objective of this research is to identify a design approach, through all scales of the design, that leads to bridges that are well-integrated, that are integrally-designed and that are valued by society. The methodology of this research is the reviewing of numerous projects from my own bridge design practice. By identifying design considerations on four levels, namely the level of the landscape, on the level of the bridge, on the level of the detail and on the level of the material, this research demonstrates how an overall approach to well-integrated, integrally designed and valued bridges can be achieved by addressing each of these scales of the design. If the mutations in the field of bridge design that have occurred over the past 150 years have taught us one thing, it is that the field of bridge design has become far too complex to be embodied by one person, whether it be an engineer or an architect. The role that the master builder played up until the late renaissance, bringing together aesthetic design and building craft into one person, is nowadays fulfilled by a team of specialists. You could say that the integrated design team is the contemporary version of the renaissance master builder. The basis of the ideal team naturally consists of a lead architect and a chief engineer. Within this team, the architect should be the design integrator; he or she has the task of securing the equilibrium between Beauty, Utility and Solidity throughout every phase of the design process. This balancing act takes place at all scale levels and through all phases of the design. Al-Bahadly, E. (2013). The mechanical properties of natural fibre composites. Faculty of Engineering Swinburne University of Technology. Doctoral Thesis. Alix, S., Philippe, E., Bessadok, A., Lebrun, L., Morvan, C., Marais, S. (2009). Effect of chemical treatments on water sorption and mechanical properties of flax fibres. Bioresource Technol;100(20):4742–9. doi:10.1016/j.biortech.2009.04.067. PMID:19477120. Appleyard, D., Lynch K., & Myer, J.R. (1964) The view from the road. Cambridge Mass: MIT Press. Avó de Almeida, M. I. (2009). Structural behaviour of composite sandwich panels for applications in the construction industry. (master thesis). Universidade Técnica de Lisboa. Boekhorst, J.K.M.T., Couterier, J.F. & Hoeffnagel, W.J.C. (1986) Effecten van Rijkswegen op de beleving. Wageningen: RBL De Dorschkamp. Chilton, J. (2000). The engineers’ contribution to contemporary architecture, Heinz Isler. London: Thomas Telford Publishing. Faruk, O., Bledzki, A.K., Fink, H.P., Sain, M. (2012). Biocomposites reinforced with natural fibers: 2000–2010. Prog Polym Sci;37(11):1552–96. doi:10.1016/j.progpolymsci.2012.04.003. Gautier, H. (1716). Traité des Ponts, ou il est parlé de ceux des romains & de ceux des Modernes … (1st ed. ), Paris, France: Chez André Cailleau. Geldermans, B., Luscuere, P., Jansen, S., Tenpierik, M. (2016). Beyond Cities: Materialen, producten & circulair bouwen. TVVL Magazine. 45(1): 22-25. Granger, F. (2007). Vitruvius on architecture. Bakhsh Press. Grünewald, S., Janssen, B., Schipper, H.R., Vollers, K.J., Walraven, J.C. (2012). Deliberate deformation of concrete after casting. Structural engineering. ICFF 2012: Proceedings of the 2nd International Conference on Flexible Formwork; 2012 Jun 27–28; Bath, UK. Bath: University of Bath. P. 132-139. Houben, F., & Calabrese, L.M. (2003) Mobility: A room with a view. Rotterdam: NAi Uitgevers. Kamerling, J. W. (1969, May 2nd). Bouwen voor de gemeenschap, inauguration speech (in Dutch). Eindhoven: Eindhoven University of Technology. Karbhari, V.M. (2001). Materials considerations in FRP rehabilitation of concrete structures. J Mater Civ Eng 13(2):90–7. doi:10.1061/(ASCE)0899-1561(2001)13:2(90). Klijn-Chevaleriasa, M., Javed, S. (2017). The Dutch approach for assessing and reducing environmental impacts of building materials. J. Building and Environment. 111: 147-159. Maheswari, C.U., Reddy, K.O., Muzenda, E., Shukla, M. (2012). Effect of surface treatment on performance of tamarind fiber-epoxy composites. ICICEMS 2012: Proceedings of International Conference on Innovations in Chemical Engineering and Medical Sciences; Dubai, UAE; 2012. p. 16–19. Majumdar, P.K., Liu, Z., Lesko, J.J., Cousins, T.E. (2009). Performance evaluation of FRP composite deck considering for local deformation effects. J Compos Constr 2009;13(4):332–8. doi:10.1061/(ASCE)CC.1943-5614.0000008. Nguong, C.W., Lee, S.N.B., Sujan, D.A. (2013) A review on natural fibre reinforced polymer composites. World Acad Sci, Eng Tech. 73:1123–30. Overdijkink, G.A. (1941) Langs onze wegen. Amsterdam: Allert de Lange. Palladio, A. (1570), Quattro Libri dell'Architettura. Venice, Italie: Domenico de Franceschi. Petras, A. (1999). Design of Sandwich Structures (doctoral thesis). University of Cambridge. Rietbergen, D., Vollers, K.J., (2008). A method and apparatus for forming a double-curved panel from a flat panel. European patent EP 20080741664. 2008 Apr 24. Schipper, H.R., Janssen, B. (2011). Curving concrete—a method for manufacturing double curved precast concrete panels using a flexible mould. Design and construction. IABSE-IASS 2011: Proceedings of the Joint Symposium of the International Association for Bridge and Structural Engineering (IABSE) and the International Association for Shell and Spatial Structures (IASS); 20–23; London, UK. London: Hemming Group Ltd. p. 8. Schöne M.B., van den Toorn, M.W.M. & Coeterier, J.F. (1997) Autosnelwegen in het Landschap; beleving door weggebruikers. Wageningen: DLO-Staring Centrum. Scitovsky, T. (1976) The joyless economy, an inquiry into human satisfaction and consumer dissatisfaction. Oxford: Oxford University Press. Smits, J. (2013). Bridge design 2.0: recent developments in the field of integrated, sustainable and durable bridges. Structural design. ICSA 2013: Proceedings of the 2nd International Conference: Structures and Architecture; Guimaraes, Portugal. p. 1–10. Songel, J. M., (2010). ‘A Conversation with Frei Otto’. Princeton Architectural Press: New York. UNFCC Paris Climate agreement. (2015). Adoption of the Paris agreement. Van Blankenstein E. (2009). Bruggen in Nederland (1940–1950). Vernieling en herstel, in Dutch. Zuthphen: Walburg Pers. Veltkamp, M., Peeters, J. (2014). Hybrid bridge structure composed of fibre reinforced polymers and steel. Struct Eng Intl;24(3):425–7. doi:10.2749/101686614X13844300210515. Walter, R. (1996). Engineers, Architects and Bridge Design. Structural Engineering International 6(2). Zalewski, W., & Allen, E. (1997) Shaping Structures: statics. New York: John Wiley & Sons, Inc.
Zini, E., Scandola, M. (2011). Green composites: an overview. Polym Composite;32(12):1905–15. doi:10.1002/pc.21224. As an architect, my career has been strongly influenced by my civil engineering background. I studied at the Technical University in Delft where I combined the studies of Civil Engineering and Architecture. I graduated in both in 1994 and thus became an architect as well as a civil engineer. I believe that it is my understanding of structural design that has profoundly defined me as an architect. In the field I have been widely recognized as an engineering architect due to the design of a wide range of structural works. With my projects I have won prizes all over the world. My designs are rational yet expressive. My fascination is to give shape to the forces at play. In this manner I have designed over three hundred of the finest bridges and buildings. Since 2012 I have combined my architect’s practice with a lectureship at Delft University of Technology, faculty of Architecture, Structural Design. I see it as my mission to bridge the gap that so often exists between architects, engineers and clients. After all, wasn’t it Vitruvius who taught us that a structure can only be of truly lasting value if it respects the balance between aesthetics, structure and function? This adage is still very valid today and constitutes the crux of my professional work. SMITS, Joris. The Art of Bridge Design. A+BE | Architecture and the Built Environment, [S.l. ], n. 3, p. 1-210, mar. 2019. ISSN 2214-7233. Available at: <https://journals.open.tudelft.nl/index.php/abe/article/view/Download%20PDF>. Date accessed: 26 apr. 2019. doi: https://doi.org/10.7480/abe.2019.3.3734.